Firm takes on eight-strong Olswang team following hire of patent prosecution group co-chair. 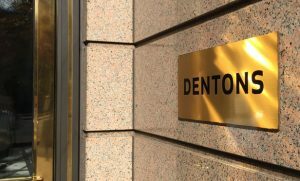 Dentons is set to launch a UK patent prosecution and opposition practice with the hire of a team leaving Olswang ahead of its merger with CMS and Nabarro. The eight-strong team will be reunited at Dentons with former Olswang patent prosecution group co-chair Justin Hill, whose move to Dentons was sealed last November, one month after Olswang’s partners voted in favour of the three-way merger.